In the United States, someone attempts suicide every 31 seconds and someone dies by suicide every 12.8 minutes. With data to suggest that only a third of military Veterans are enrolled in the VA system, the need for culturally considerate community providers trained in evidence-based practices for the assessment and treatment of suicidal behavior has never been greater. Based on content from the Center for Deployment Psychology, this training will provide you with information regarding the health significance of suicide with a focus on military and Veteran populations. Rates of suicide in military and civilian populations are provided, while military-specific risk and protective factors are discussed. A summary of empirically derived demographic and clinical variables that can be used in making evidence-based determinations about a person’s risk of suicide will be reviewed. In addition, components of empirically-based treatment protocols will specifically address suicidal behaviors. Finally, the challenges behavioral healthcare providers face when working with suicidal clients are reviewed with recommendations for provider-centric interventions to increase positive outcomes and better manage risk in practice. 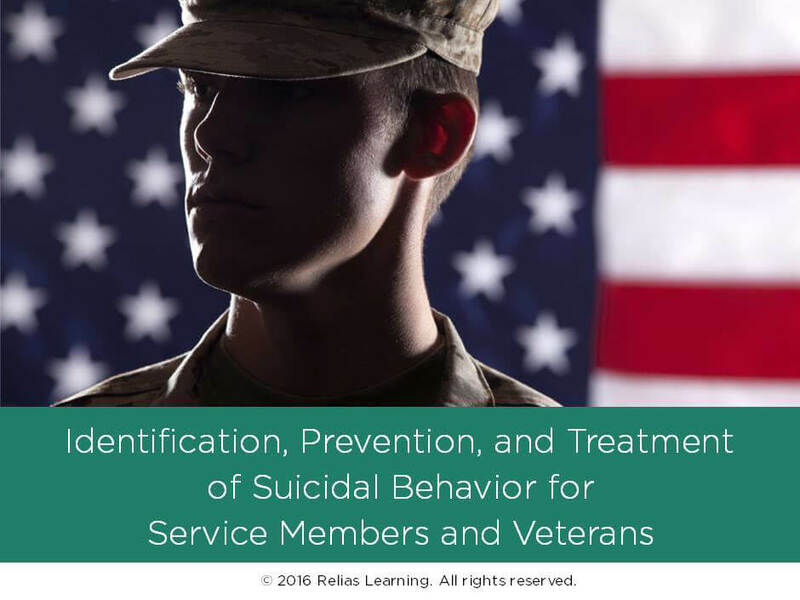 A blend of experiential exercises and case examples will give you the tools you need to more competently assess and address suicidality in military and Veteran populations. This course is intended for any behavioral health provider working with military or Veteran populations. Identify risk and protective factors for suicide that are either specific to or more prevalent for the military than in the civilian population. Discuss how the theories of suicide behavior apply specifically to the military population. Demonstrate how evidence-based strategies can be used to more effectively assess risk and manage suicidal behavior in a clinical setting. Michelle Cornette, Ph.D. is a clinical psychologist working as the Suicide Prevention Subject Matter Expert at the Center for Deployment Psychology (CDP), Department of Medical and Clinical Psychology, Uniformed Services University of the Health Sciences in Bethesda, MD. In this capacity, she is developing a suicide prevention evidence-based psychotherapy workshop for military mental health providers as part of the CDP's Evidence-Based Psychotherapy Program, and she is the Faculty POC for the one-week civilian training course. From 2003 to 2011, Dr. Cornette worked at the Zablocki VA Medical Center, where she was Suicide Prevention Team Leader, Mental Health Division Research Lead, and Veterans Integrated Service Network (VISN) 12 Suicide Prevention Director. In the latter capacity, she was responsible for overseeing suicide prevention activities at the seven VA facilities in VISN 12. She also chaired Zablocki's hospital-wide suicide prevention committee. She holds adjunct faculty appointments in the Departments of Psychology and Nursing at the University of Wisconsin-Milwaukee. Dr. Cornette earned her Ph.D. in Clinical Psychology from the University of Wisconsin-Madison, completed her post-doc in the Department of Clinical and Health Psychology, University of Florida, and completed her internship at the DVA/Medical University of South Carolina Psychology Internship Consortium. Disclosure: Michelle Cornette, Ph.D. has declared that no conflict of interest, Relevant Financial Relationship or Relevant Non-Financial Relationship exists. Regina Shillinglaw, Ph.D. is a Deployment Behavioral Health Psychologist with the Center for Deployment Psychology and works as the Assistant Training Director in the pre-doctoral Clinical Psychology Internship Program at Wright Patterson Air Force Base (WPAFB) in Ohio. Dr. Shillinglaw trains psychology, psychiatry, and social work residents at WPAFB on deployment-related mental health issues. In addition, she treats patients and supervises residents in the mental health clinic. Dr. Shillinglaw is a consultant at WPAFB and in the local area for military mental health issues. She also provides training to other mental health professionals on deployment-related topics such as military culture, families and deployment, and PTSD in various locations as needed for the Center for Deployment Psychology. Dr. Shillinglaw received her Ph.D. in Clinical Psychology from the University of South Carolina in 1998. Between 1997 and 2001, she served on active duty in the United States Air Force. During this time, she completed an internship at Wright Patterson Medical Center from 1997 to 1998 and then was stationed at Robins Air Force Base for three years as the Chief of Psychological Services. Dr. Shillinglaw’s areas of interest include military psychology, PTSD, and the treatment of suicidal behavior. Disclosure: Regina Shillinglaw, Ph.D. has declared that no conflict of interest, Relevant Financial Relationship or Relevant Non-Financial Relationship exists. Instructor: Marjan G. Holloway, Ph.D.
Dr. Holloway is an Associate Professor of Medical and Clinical Psychology and Psychiatry at Uniformed Services University of the Health Sciences (USUHS) and a faculty member of the Beck Institute for Cognitive Behavior Therapy in Philadelphia. She completed her postdoctoral training at the Center for the Treatment and Prevention of Suicide and the Center for Cognitive Therapy at the University of Pennsylvania under the mentorship of Dr. Aaron T. Beck. Currently, Dr. Holloway is the Chair of the North Atlantic Treaty Organization (NATO) Task Group on military suicide. She has previously served as a member of the Defense Health Board Task Force on the Prevention of Suicide by Members of the Armed Forces and has been a contributor to the Center for Deployment Psychology’s curriculum on military suicide prevention over the past six years. Dr. Holloway’s Laboratory for the Treatment of Suicide-Related Ideation and Behavior at USUHS, with generous funding from various DoD and private sponsors, focuses on military suicide prevention research and development of evidence-based suicide prevention practices. Most recently, Dr. Holloway and her team have developed a revised clinical guide for the United States Air Force on suicide risk assessment, management, and treatment. Disclosure: Marjan G. Holloway, Ph.D. has declared that no conflict of interest, Relevant Financial Relationship or Relevant Non-Financial Relationship exists. Lisa French, Psy.D., is a clinical psychologist who has been with the CDP since 2011, initially working as a Deployment Behavioral Health Psychologist at Wilford Hall Ambulatory Surgical Center and now serving as a Cognitive Behavioral Therapy Trainer. Dr. French graduated from Oregon State University where she majored in Psychology and earned her Master’s and Doctorate in Clinical Psychology from Pacific University in Forest Grove, Oregon. She graduated from the Wright-Patterson (USAF) Medical Center Psychology Residency Program in 2003 and served on Active Duty as a psychologist in the United States Air Force from 2002-2011. Dr. French deployed in 2006 to Afghanistan in support of Operation Enduring Freedom. As a military spouse, Dr. French continues to experience military life daily and has firsthand understanding of the demands of military service on the family. Her professional interests include military psychology, the assessment and treatment of PTSD and depression, exercise psychology, and suicide prevention/treatment. Disclosure: Lisa French, Psy.D. has declared that no conflict of interest, Relevant Financial Relationship or Relevant Non-Financial Relationship exists. The target audience for this course is: entry and intermediate level Alcohol and Drug Counselors; entry and intermediate level Professional Counselors; entry and intermediate level Psychologists; entry and intermediate level Social Workers; in the following settings: Health and Human Services.